Without mosquito nets in our room we had yet another sleepless night. The loud spinning fan above our beds meant we didn’t hear them, but they were there biting us constantly resulting in another restless itchy night. The old wooden walls of the colonial era government rest house was no barrier for these guys who managed to infiltrate in numbers sufficient to cause considerable annoyance. Mosquitos here seem to have a different effect to the ones we encountered across Europe, they cause an instantly itchy bite that by the morning is almost nothing… the smallest item of flesh on show is ravaged by them resulting in us being awake for a good amount of the night. Our room was in a rest house, old colonial era government run ‘hotels’ that used to provide rooms to travelling members of government departments or officials carrying out business in different parts of the country. Now they are open to anyone, but are still mainly frequented by people in the government or company employees that have business in the area – a kind of Sri Lankan premier inn. 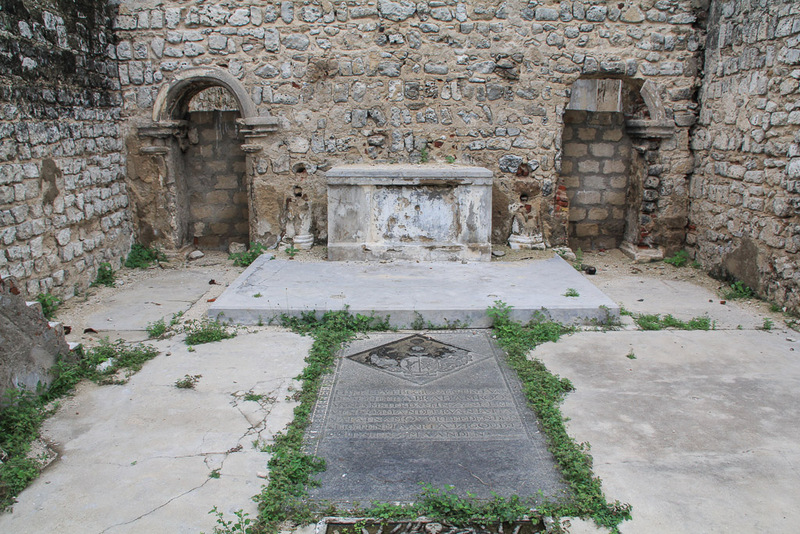 This one had a very lively bar, a dark large hall of a room filled with men drinking Lion Strong beer (8.8%) and the local spirit made from coconuts – Arak. It was a fairly unsavory place and loud until the closing of the bar at 11pm so we joined in instead of being kept up in our room. The town we were staying in had not much going for it, it was mainly a transport hub on the road to Jaffna at the far north of the country. 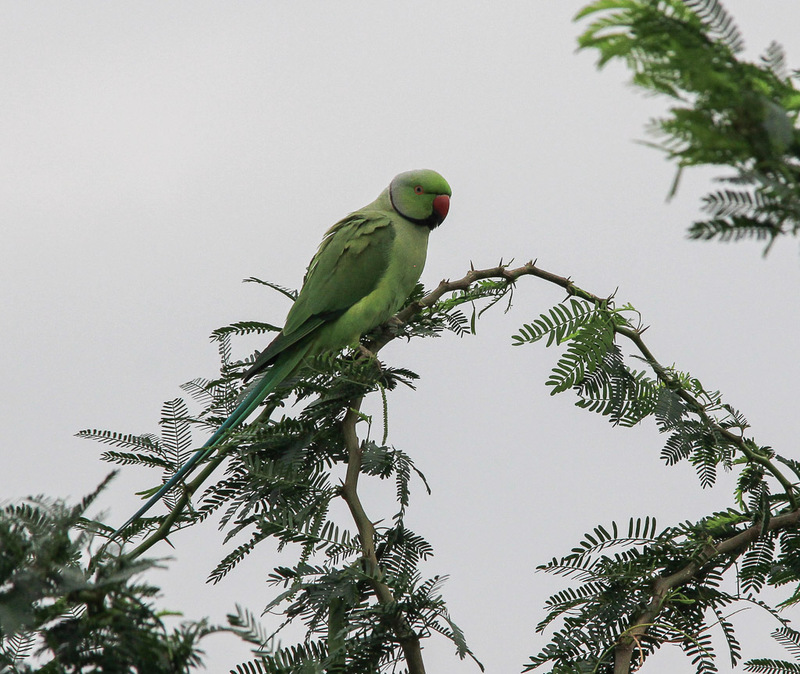 It is in the Tamil area and was on the front line until the Sri Lankan government offensive in 2008, as a result it is now heavily militerised with a large air force base and many army camps. This is a cause of contention for locals with a reported 1:3 ratio of army to local residents. The town itself is scruffy with few old buildings, but the change in culture is strongly evident with the small colourful Hindu temples and blaring Bollywood style music. At 7am Cakey knocked loudly on our door as he carried out his round of handing out cups of very sweet very milky tea to everyone who had stayed the night. Stepping out onto the covered walkway that our room faced I could see it was chucking it down… the prospect of cycling the 80 odd km we had to do today didn’t seem too thrilling. Nevertheless we packed up and headed off into the rain. We knew today wasn’t going to be packing any real punches, the road we were cycling on had been fought over many times so most of the villages that were along it no longer exist. Some people have returned to the area, and signboards indicate that various international organisations have provided money and assistance for rehousing internally displaced people, but it is still very sparsely populated. 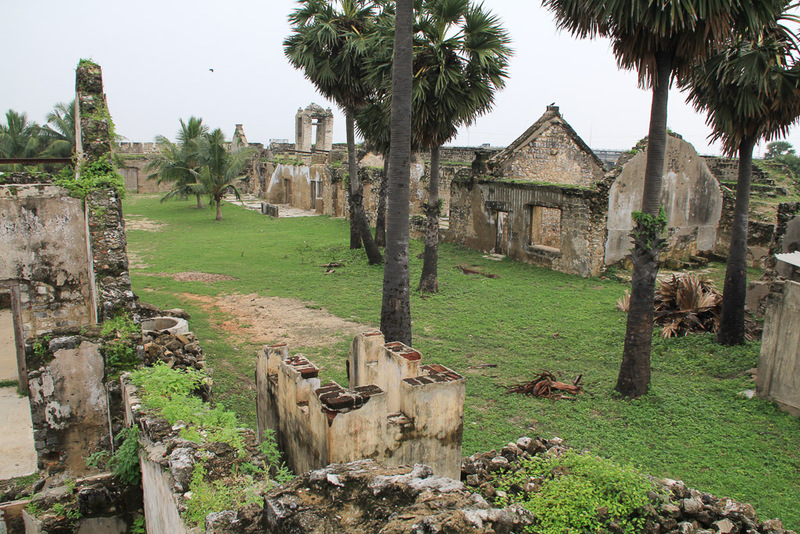 A visitor with no prior knowledge of Sri Lanka would have no idea of what happened here, there are no visible damaged buildings and the fast growing vegetation has hidden any marks on the land. There were plenty of ramshackle army camps, tin shacks in small plots separated from us with rusting plant covered barbed wire. A small old Portuguese/ Dutch fort. The rain continued but fortunately only lightly. The road was terrible for stretches and worse in others. A good 20km was a work in progress, the rain mixed with the red dirt created a thick mud that was like treacle to cycle through and covered us in muck. The road undulated gently but other than that it was featureless with low level bush and paddy fields either side, there was little to look at so we spent most of the day trying to spot birds that we haven’t already seen. 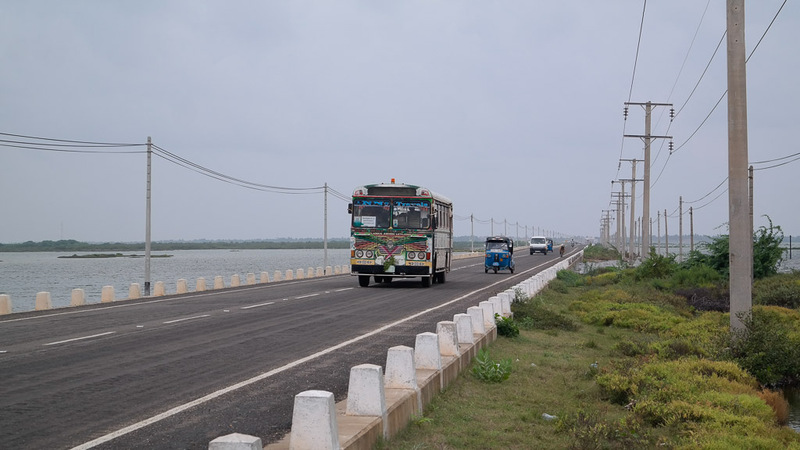 We had no food and didn’t find anywhere to get any so had to press on, by the time we reached the coast we had a 4km causeway to cross that led out to the island of Mannar. Unfortunately the wind was blowing very strongly straight into our face slowing us down to an almost crawling pace. After not eating all day it was beyond painful to have to struggle to cover the 4km, something that would normally take less than 15 minutes took well over half an hour. We struggled to find the place we wanted to stay – it doesn’t appear to exist anymore so had to carry on looking for something else. The next small guest house had no nets so we turned it down. We cycled around town again but found nothing else so have a room with no nets again and therefore a potentially restless second night. 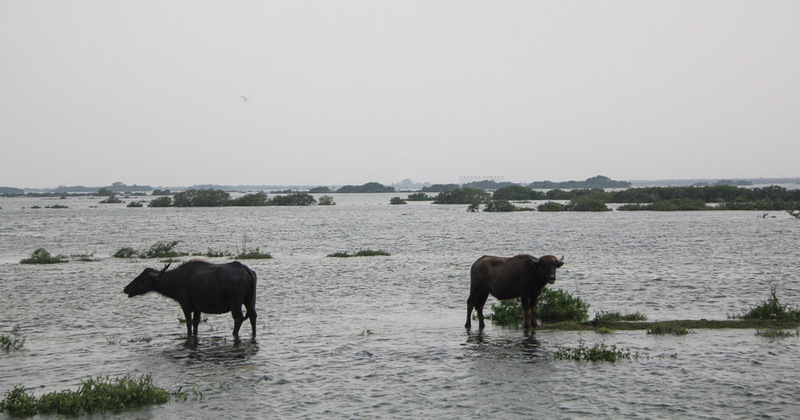 Mannar is a small flat island just off the coast connected by a causeway, we planned on staying a day to have a look around but on the second day it started raining very heavily as soon as we set off. Apart from seeing a baobab tree planted by Arab traders a few hundred years ago we saw and did nothing all day. The tree was said to have been planted in order to feed camels the traders bought over with them, but whoever came up with that story must be telling fibs. First off a baobab tree takes forever to grow, and second they have bugger all leaves on them so unless you had only one camel that didn’t want to be fed for 50 years then there was no way you were going to plant a tree to feed your camels. 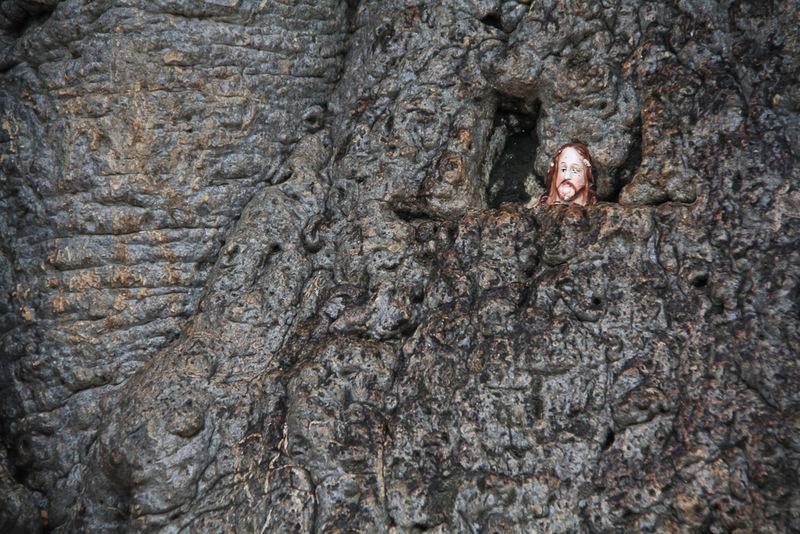 The tree had a small cross eyed model of Jesus in it, that was funny – for ten seconds, the rest of the day we wondered what the hell we were going to do in a dirty, wet, ramshackle village with nothing but dust and donkeys. Oh yes, Portugees traders left donkeys behind and they somehow have remained. They are said to be wild, but they just sit at various points around the town looking as bored as we felt. It turns out we both wrote about today… instead of wasting Sheenas effort you can read what she thought here. There’s a couple of things about Sri Lanka that I was not expecting.The first is the President. It’s not that I wasn’t expecting them to have one, it’s the fact that his picture is absolutely everywhere that’s a bit crazy. Anywhere something new has been built, a road, a post office, a school; there will be massive banners with his face on it, like he built it all himself. Stadiums, train stations and I assume small children, are named after him with abandon, and quite often, for no apparent reason, there will be hundreds of posters with his face on, just plastered all over the place. For a man I knew next to nothing about, his is a face I have grown wearily familiar with, I could definitely pick him out of a line up. The next thing that’s a wee bit weird, scratch that……. really weird, is the practise of people giving us sweets instead of our change at the shop. We got dinner this evening and when we paid, Sam handed over 300 rupees and expected 10 rupees change, but the lady just handed over a chocolate bar as if it was no big deal! What’s worse is, we usually don’t get a bar, it’s two hacks cough sweets. And they do it everywhere, it’s so common that in all shops there is a box of sweets beside the cash register to use instead of money. I have a plan actually, if someone can give me them as change, surely I can use them to pay? I can’t wait to see their faces when I try to pay for dinner with 150 hacks! To round off my trio of weirdness, I am going to highlight the appalling inability of the inhabitants of one of the world’s foremost tea growing nations to make a cup of tea. I like my tea sweet and milky but this stuff is an absolute joke! I watched a guy making tea this morning and I’m pretty sure he put 3 desertspoons of sugar into each cup. It’s more like chai than tea and isn’t so bad when you get used to it, but our first cup this morning could come under the heading of neither, it was pants! The moment we switched on our light this morning, Cakey was straight in with the cups of tea. He must have been waiting for us to get up. It was weak as ditchwater, but at least his heart was in the right place! After packing, we loaded up our bikes and made a beeline across the road to the very excellent Hindu canteen, where the food was good and the tea was so strong you could trot a mouse across it. Great place! While we were there, an older guy working at the Lanka Rest House where we had stayed told us that he collects foreign coins. We’ve read there’s a bit of a thing here where people will slip this into conversation, ask you for foreign coins and then get some other unsuspecting tourist to change it into rupees for them epxlaining that they were given it as a tip. Basicaly, it’s begging but seems more respectable. Far be it from us though to stand in the way of a man’s coin collection and as it happened, we did have some foreign coins from Serbia. So we gave him one of these shiny, golden, sparkly coins and his face lit up. When he asked us how much one Denar is worth, he looked pretty crestfallen to find out it’s about 2 rupees worth. With breakfast out of the way, we started our cycle for the day. The road was quiet which is always welcome, especialy after having spent the last few days on busy main roads. There was less stuff hurtling past us, less buses honking their horns, and less tuktuks with their occupants leaning ouy pecariously and yelling “where going?” as they pootled by. As has been the case for several days now, the wind was once again, in our faces. That coupled with a road that wasn’t in great condition meant that the going was not quite as quick as we might have liked. The scenery is now getting quite monotonous and it’s all we can do to ty and keep ourselves amused as we cycle along. It’s not tiredness that heralds the end of our ability to keep on going at the moment, it’s boredom! Eventully, about 40km in, we reached a junction with a larger, newer road. The surface looked as if it had just been laid, and it was! This was great for the first 20km or so, we zipped along, bums were comfy and we debated heavily whether or not this road would go all the way to Mannar. Being the optimist that I am, I thought we might be in luck. But Sam seems to have a man on the inside at the National Roads Authority and reckoned that it would finish about half way there. It did, with a bang. Like a slap in the face, the smooth tarmac morphed into mucky, gravelly roadworks, covered in potholes. The road for the next 20km was wide enough fo one vehicle and we found oursleves having to make way for cars coming behind us and getting splashed by buses as they rattled past. 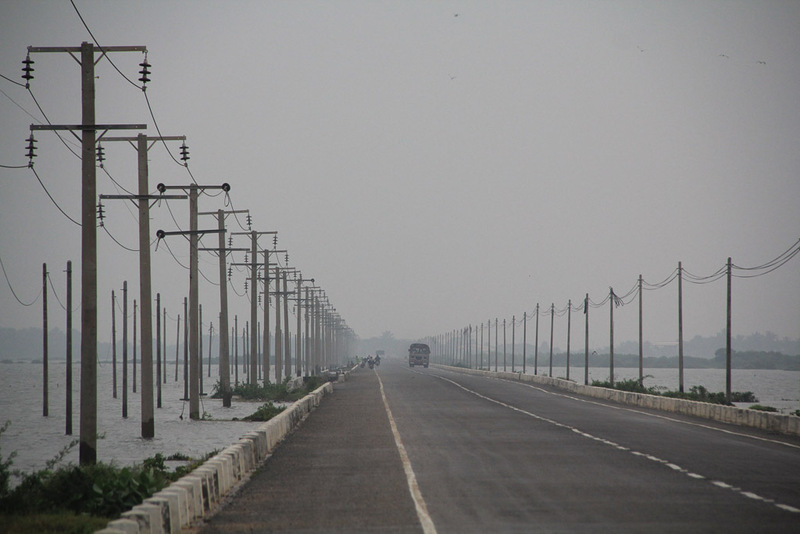 For all it’s difficulty though, it was something to focus on and the afternoon flew by before we found oursleves at the causeway to Mannar Peninsula. At this stage the wind had picked up, the 4km of road stretching over the sea to our destination seemed to stretch on forever. We were nearly there but the howling wind ensured that the final stretch was a painful one! Mannar was previously occuppied by the Portuguese and afterwards by the Dutch and arriving into the town perched on the sea, we could see the remnants of the fort they had built. Another legacy from the Portuguese which is visible everywhere you look was the introduction of donkies and today, many of them stroll around the streets, take naps on the roundabout and no one pays them the slightest bit of heed! We had earmarked a couple of places to stay before arriving and so went to check them out.The first seemed to be located on some non existant street, so we checked out the second on our list and decided to have a look at the third before making a decision. 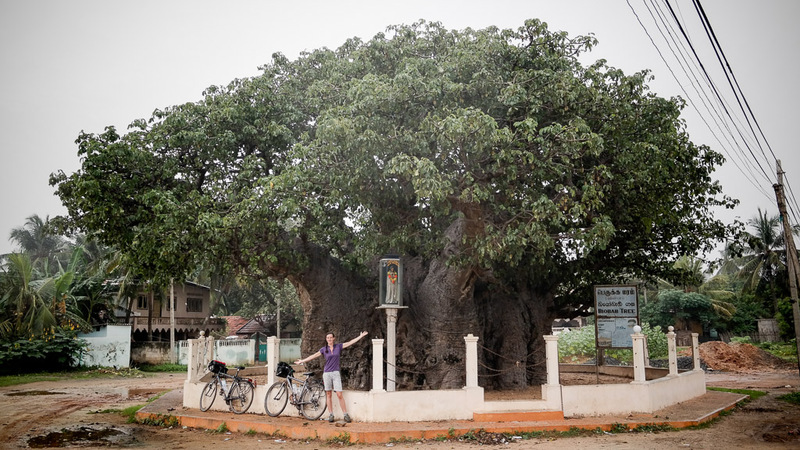 We cycled on to the third where the price was extortionate, laughed at how much he was charging and promptly returned to the Boabab guest house. Aside from the vicious mosquitos hanging around the front, it’s perfectly fine. 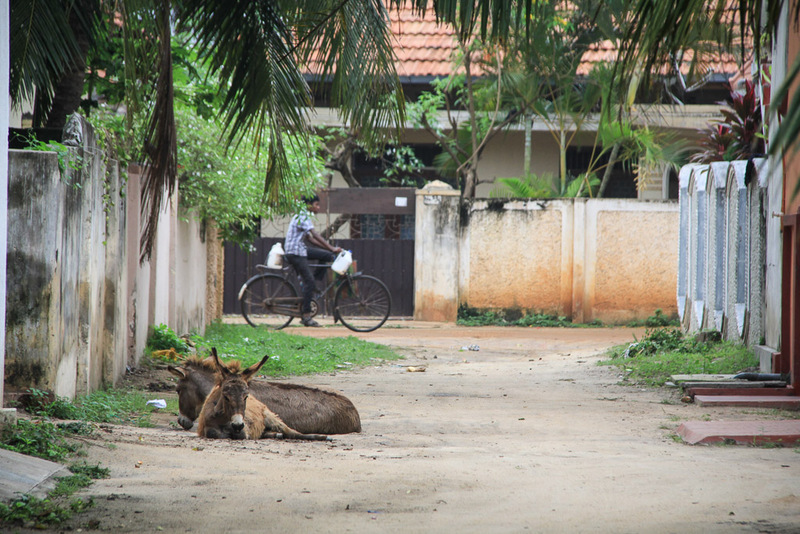 ← Sri Lanka – Making our way north.